Just 17 miles southeast of Sherman on US 69 and SH 11 in extreme east Grayson County, Whitewright is a prototypical Texas town with one foot in the past and the other firmly planted in the here-and-now. Settlers from Kentucky established the area in the late 1800s. Whitewright was a land rich for cultivation and cattle, a wilderness of grasses, flowers and forest. Churches and schools were established very early and the construction of the M.K.T. Railroad from Denison to Greenville hastened the growth of Whitewright. The town was incorporated and named for New York capitalist William Whitewright, who had an interest in the M.K.T. Railroad. Although the Baptists, Presbyterians and Methodists built churches in the area in the 1850s, the Christian Church was the first church in Whitewright. It was used as a community church and Rev. J.W. Connelly preached the first sermon. In 1879, the town’s first baby, Jesse Rayborn, was delivered by the town’s first doctor, D.M. Ray. Grayson College was founded in 1886 by Mr. Piner and Mr. Anderson on the north edge of town. A few years later, Whitewright had a population of 2,000 and was the first political subdivision in North Texas to eliminate saloons by a vote of the people. The post office was established in 1888. 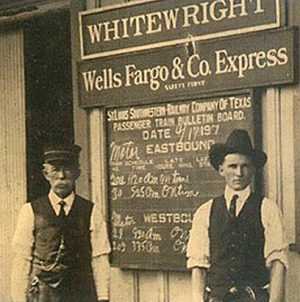 Whitewright was thriving as a business center by 1894, with hotels, doctors, lawyers, dentists, restaurants, grocery stores, drugstores and banks. The two cotton gins in town bought 150,000 bales of cotton that year. Whitewright also boasted a flour mill, two lumber yards and a newspaper. A fire destroyed much of the north side of town in 1884, and another fire in 1911 nearly demolished the entire town. Twenty homes and every business except the First National Bank were destroyed. The bank building still stands and was used as a public library until the library was moved to the city municipal complex in 1978. Steve Armstrong of Denison has been practicing falconry for more than seven years. Armstrong takes his well-seasoned Harris’ hawks out after quarry ranging from small rodents to the occasional rabbit.